Phase II of the Osgood building renovation included converting the second floor from an existing inpatient unit into a safe and supportive environment for lesbian, gay, bisexual and transgender adults suffering from addiction and behavioral health issues. 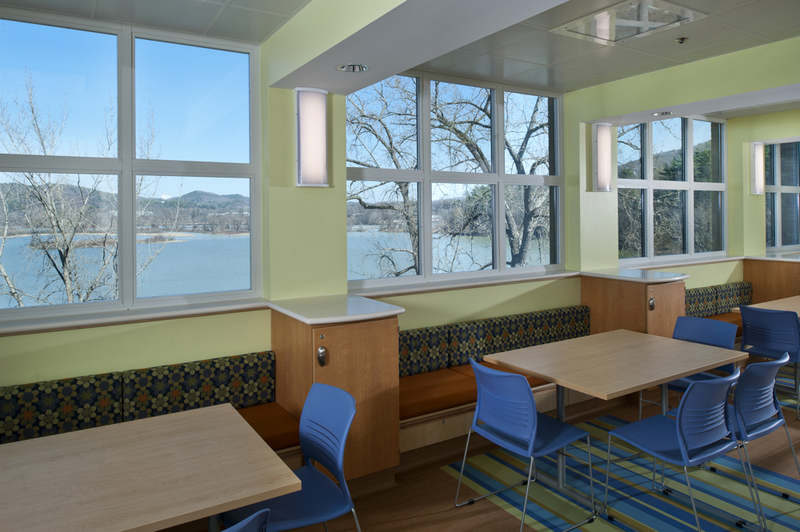 Programming spaces with large windows overlooking the adjacent lake and mountain range beyond creates spaces that allow reflection and brings the feel of nature into the space. Concerns about safety were addressed through the use of materials while giving the spaces a more residential feel. The overall design improved acoustics, and enhanced safety for patients and staff. The Osgood building is listed on the National Registry of Historic Buildings and renovations to the outside have been reviewed and approved by the Vermont Division for Historic Preservation. Part of the design team and in charge of overall interior design concept and detailing. As a result of the design process and working with the client, was asked to develop and implement campus standards.